Learning bird language is a skill accessible to anyone. This is a real-world skill that is based in the study of bird behavior and what it tells us about the natural landscapes around us, such as a bobcat hiding in a thicket. It’s a very old skill that has been used by a variety of peoples in different traditional cultures from around the world to avoid dangerous predators and find animals hidden on the landscape. Birds are very sensitive to their surroundings, and have very keen eyesight and hearing. They rely heavily on awareness of their environment to escape potential dangers. They also happen to be very vocally expressive creatures that can be heard at a distance by human ears. When some kind of danger is perceived by a bird, it makes vocal signals and takes certain bodily postures that communicate its concern to all the birds within listening or seeing distance. This communication is what we call bird language and it is utilized as a source of information by many other animals, including many mammals both large and small. You could say that bird language is the “secret language of the natural landscape.” It is really only secret to us because we generally do not take the time to pay attention to the lives of other animals. This, however, can be changed and with a little practice you can learn to interpret the birds and decipher events that might be beyond the limits of your eyes. One of the best places to start learning to understand bird language is to get a clear grasp of the difference between baseline and alarm. Baseline is that state in which the birds are behaving in a related manner and no immediate threat is perceived. 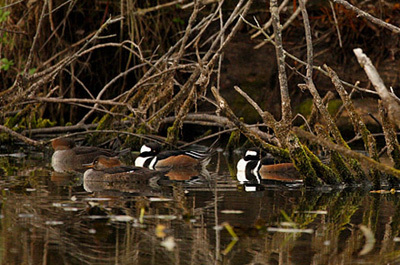 Take a look at this photo of a small flock of resting hooded mergansers in this quiet part of an urban swamp. Notice how relaxed they appear, several of the birds even have their heads tucked into their wings as they snooze. With their body language they are expressing that they are calm, relatively unconcerned and that all is well. Baseline behaviors also include such things as feeding, singing, calling to flock mates, juvenile begging and even territorial aggression. You might wonder how it is that something as intense as territorial aggression can be counted as a baseline behavior in bird language? Well, it is still considered baseline because although the two birds having an altercation might be expressing rather intense body language and intense sounds, the behavior of the other birds around them is still calm and rather indifferent. That is one of the visual and auditory keys to distinguishing baseline from the other major category: alarm. If multiple birds, especially multiple species of birds, are demonstrating alarm behaviors then it can be considered an alarm. Alarm behaviors include things such as intense calls focused at the predator (often called “alarm calls”), focused and tense body postures, rapid and panicked flight, diving into cover, falling completely silent or leaving the area entirely. 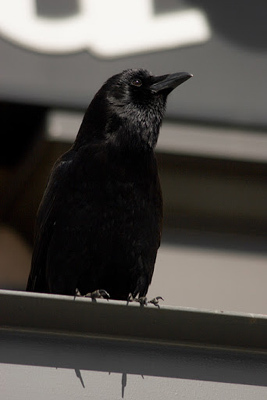 Notice the focused posture of this crow as it watches a passing hawk in an urban area. 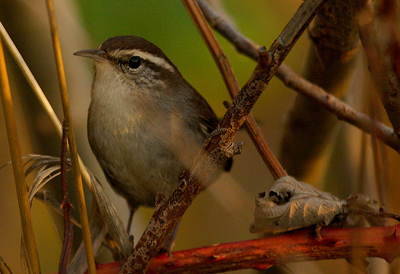 Also take a look at this Bewick’s wren that is skulking in a shrub as it tries to stay out of sight of a nearby sharp-shinned hawk. Both birds are demonstrating a degree of alarm through their posture and behaviors. One is tensing up and staring fixedly, while the other is sitting very still and not making a sound in the densest thicket it could find. Also consider that not all species respond to the same predators with the same level of concern. 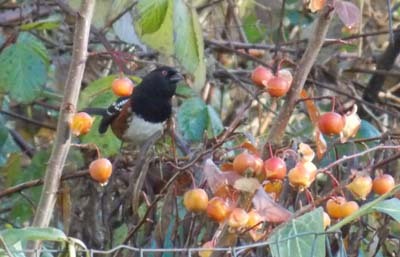 For example, a black-headed grosbeak singing near the top of a tall cottonwood 100 feet off the ground may not be as alarmed about a house cat hunting on the ground below. Meanwhile, a robin feeding in the short grass at the base of that same tree would be much more concerned. 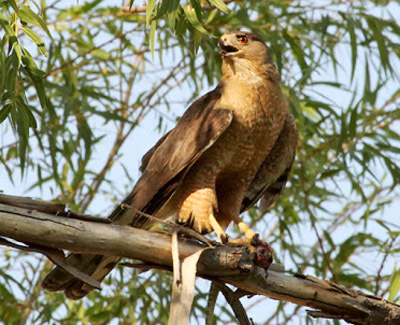 On the other hand, an avian predator (such as the Cooper’s hawk in the photo below) that feeds on birds would elect a similar degree of concern from both birds. And now we have arrived at another interesting bit of information regarding bird language. Different predators are treated in different ways by different species of birds. With time and practice, you can learn to recognize the patterns of disturbance created by specific types of predators. Take a moment to imagine this bird language scenario. 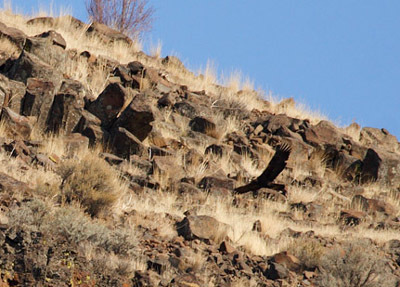 A golden eagle is flying low and tight to the ground near the top of a ridge in the sage-brush steppe of eastern Washington State. As it passes near a vegetated ravine and pops above the horizon line of the hill, it disturbs some small birds which give their distinctive alarm calls. Those calls are noticed by a nearby California ground squirrel, and it echoes the alarm in its own voice further across the hills and down into the valley below. All of the nearby yellow-bellied marmots, California ground squirrels and a flock of chukar partridge take immediate notice. The partridge all hunker into the densest thicket they can find, the marmots and squirrels both dive for cover under rocks and into burrows. Further away, a deer looks up the hill towards the source of the alarm sounds and a ground squirrel on the opposite hill side sits up alertly and watches the distant eagle as it hunts. This whole chain of events was triggered by the nearby presence of the hunting eagle. The appearance of this huge bird of prey disturbed the small birds. 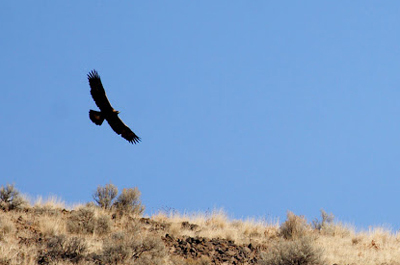 Even though the small birds themselves were not likely targets of the eagle, it’s sudden appearance and hunting behavior disturbed them enough to give alarm calls. This got the attention of the squirrels, marmots and chukar that were definitely potential prey items for this eagle. This pattern has been repeated in this spot many times, and the animals recognized the danger. They had likely seen that eagle hunt in that area and in that manner many times before. Therefore, the eagle was attempting to catch an animal unaware. Animals that survive being hunted by predators must be alert to any sign of danger, and therefore, tend to have a keen awareness of the bird language around them. We too, can learn to notice these patterns. Go out and watch the birds in your yard or neighborhood. They are your best teachers of bird language, since they are birds you can watch regularly. Pay special attention to those birds that spend a lot of time on or near the ground. 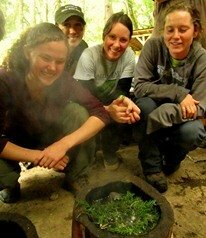 With practice, you will learn to decipher the language of the birds! Enjoy your time watching and learning from these alert, feathery communicators.